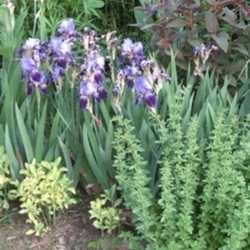 Smart gardeners know that most perennials should be divided every few years. Here are some tried and true tips and methods that I have used for a number of years. Many of us have found ourselves with having to move a plant for one reason or another. Sometimes we really don't have a new location to place that plant. I have established what I call a "holding area," a spot where I can place a plant for a period of time before moving it to a permanent location. A little trick that I use to plant in a temporary location is to take an old plastic pot a little larger than the root ball that you are moving and cut the bottom out of the pot, Dig a hole in the soil, set the pot into the ground, and place the plant into the pot and backfill with soil. This will make it much easier to remove the plant when moving it to its permanent home. When moving the plant you may want to take the opportunity to divide it. Keep them healthy. 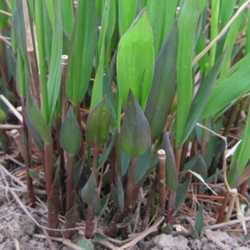 Many perennials grow quickly and form large clumps. If you don't divide them every three to four years, these clumps can die out in the middle, leaving a bare hole. Overcrowded perennials are also more susceptible to attack from fungal diseases and insect infestations. Keep them looking good. Overcrowded perennials often have fewer and/or smaller flowers than their well-spaced and divided counterparts. If your perennials are drastically in need of division, they may even appear stunted. Keep them in bounds. Some perennials (including gooseneck loosestrife, plume poppy and obedient plant) are especially vigorous or even aggressive. Dividing these plants will help keep them from overwhelming their neighbors. Make more plants. Dividing perennials provides you with more plants of the same variety -- perfect for adding to other places in the garden or trading with friends, family, or neighbors. Why not organize a perennial exchange in your community? While you can divide most perennials anytime during the growing season, spring and fall are best. Dviding your perennials can be stressful on the plants and they'll recover better from the shock in cool, moist conditions. That said, if you want to divide your favorite perennials in summer, just be sure to keep them well watered afterward. 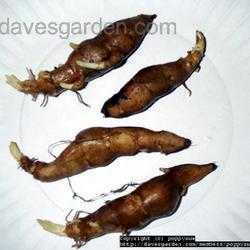 For newer plants, it's advisable to wait to divide them until they are large enough to make several clumps. Assemble your tools; (Figure 1) I like to use a transplant shovel to dig out the plant, Well-established plants can have a massive root system, so I like to use a frozen food saw (I picked up at a garage sale for less than a buck) to cut through the roots. On larger plants I use a pruning saw or sometimes a hatchet. Dig the Clump; (Figure 2)Dig up the clump to be divided by inserting the shovel deep into the soil around the perimeter to loosen roots and isolate the clump. Here's a hint: Watering the perennial a couple of days before you dig it will soften the soil and save you effort. 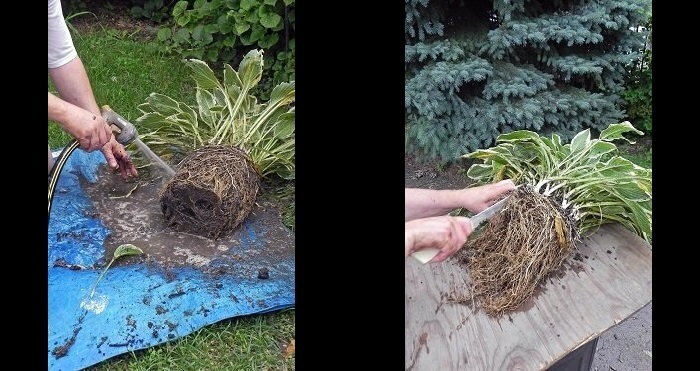 Wash The Roots; (Figure 3) Once you dig the plant out of the ground, shake, wash, or brush any excess soil from around the root ball. This makes it easier to separate the clump. I like to use a strong stream for the garden hose to remove the soil. Cut apart individual crowns. Each clump needs to have sets of leaves and roots in order to grow. Peony (Paeonia)By dividing your perennials on a regular basis every 4 to 5 years you will ensure that your plants remain healthy and will provide beautiful blooms for years to come.